Click to view images from the 2019 Foundation Gala and Auction! Support of ASA's youth program through scholarships or program sponsorship. Continuing education programs for beef enthusiasts and members of the youth program. Expanded educational programs for ASA and members of the beef industry in the areas of performance testing, leadership, and bovine management. Research grants to qualified colleges and universities, for documentation of bovine performance, and research into the prevention of, or cure for cattle diseases. Other projects or activities as may be determined by the parent association. Contributions designated for this endowment will be invested as part of good financial planning to ensure the Foundation will stay strongly committed to its mission and to ensure ASA continues to advance and maintain its leadership in the industry. Previous donations to the Foundation were invested by the current and past Foundation board members to create this endowment. The endowment is a permanent, self-sustaining source of funding which allows stability for the future and will provide a steady source of income over time. The Foundation may commit a percentage of the invested capital each year toward an educational, research or youth program. “Brand Yourself in Simmental History”; be included in the ASA newly built office building, through a personalized branded wall plaque, or landscape by dedicating a tree outside the building. Several levels of sponsorship exist, with all proceeds going to the Foundation. You may designate which of the three pillars you wish to support by tagging your donation to a specific project. Fall Educational Symposium. Each fall the ASA will host an educational session in conjunction with the fall board meeting. The 2014 session was very successful with nearly 150 attendees. The day-long event featured genetically oriented talks from nationally recognized experts in livestock genetics and animal breeding. Seedstock producers, commercial cattlemen, industry personnel, other breed associations, and academics participated in the session and following social. Join us in hosting the 2015 Educational Session by donating funds for this event. Goal $10,000/year. The AJSA Steer Profitability Competition (SPC) is designed to provide members of the AJSA meaningful exposure to the opportunities and challenges associated with cattle feeding. The SPC will not only allow participants to measure and compare the profitability of their own animal(s), but of greater importance, will introduce young beef enthusiasts to peers, mentors, industry advocates, and experiences that are exceedingly difficult to acquire for any beef producer. The cost of feed is the number one cost to the beef industry annually (65% of the production cost of beef). The ability to predict differences in feedlot intake of sires’ offspring is an important component in the assessment of differences in profitability between sires. The Feed Intake Project collects individual feed intake data on calves of known sire groups to improve our ability to predict feed intake and thus improve our ability to predict differences in profit. Goal $30,000/year. Walton-Berry Graduate Student Support Grant Walton-Berry Graduate Student Support Grant supports graduate education with an emphasis on genetic improvement of livestock. The fund originally started by Jim Berry of Wildberry Farms honors Dr. Bob Walton’s lifelong efforts in animal breeding and raising Simmental cattle. Walton-Berry Graduate Student Support Grant funds graduate education in research programs to directly improve applied livestock genetics and help build future experts in animal breeding. 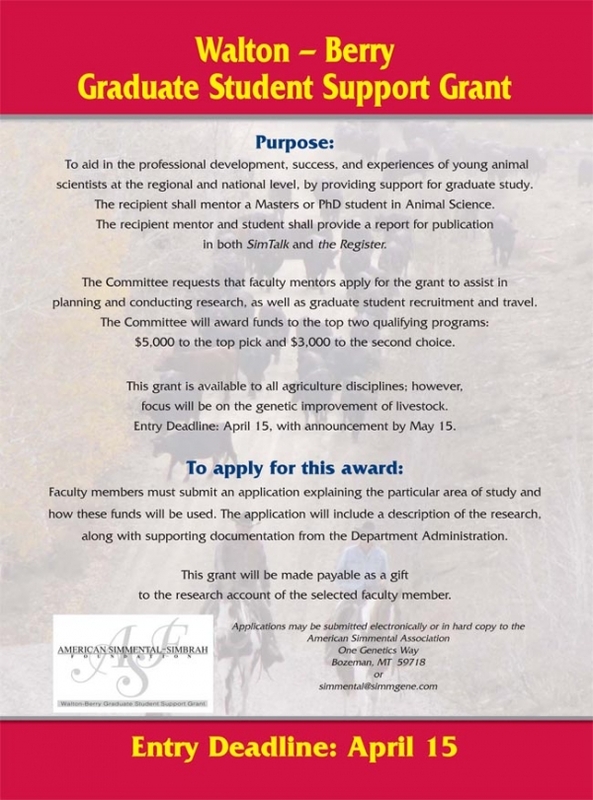 There are two awards - one for $5,000 and a second for $3,000 for graduate education programs; each recipient contributes to ASA Publication regarding their research both SimTalk and the Register. Click here for detailed information. AJSA Canadian Exchange Project. Each summer, two AJSA Board of Trustee members will be randomly selected to attend the Young Canadian Simmental Association National Classic. This is more than just an opportunity to travel, but rather an opportunity for AJSA members to learn about international agriculture, new ideas to progress the association, and gain new friends in an attempt to build their resume and personal experience. to raise funds for the Eastern and Western Regional Classics, despite which state holds the classic. Eastern and Western Regional Classics. host classics, due to a lower financial cost. Following suit of a previously successful regional group, the Western Region formed their own group. The key is to see states within a specific region as one unit, rather than individuals. The establishment of these regional groups is to raise funds for the Eastern and Western Regional Classics, despite which state holds the classic. The Eileen DuJardin Memorial AJSA National Classic Scholarship has been established through the American Simmental-Simbrah Foundation. Funds from this scholarship will help sponsor an AJSA member to attend the National Classic each year. Donations can be made via check sent to One Genetics Way, Bozeman, MT 59718, or via credit card by calling 406.587-4531. Read about Eileen here. Click here to make a donation to the ASA-Simbrah Foundation. American Simmental~Simbrah Foundation is a 501(c)(3) nonprofit organization. Scenes from the 2019 Foundation Gala. Thanks to all the supporters, buyers, and donors who made this a great success!